We visited all the best tourist sites in Paris so you don’t have to…. and we loved every minute of it. To be honest, we’d been putting off going to Paris in favour of somewhere a bit…. je ne sais quoi, somewhere a bit more ooh la la, more exotic. Paris is the third most visited city in the world, surely it has something to see. The fact is we have never been and it’s on our doorstep more or less. So, did we we regret going to Paris? Non, je ne regrette rien. Of course, the English have been visiting France for years, sometimes for a little Chevauchée, burning a teenage girl, or for a little shopping expedition to stock up on cheap booze, fags and cheese while practising your school learnt lingo of avez vous un cuppa? (louder and slower than it needs to be of course). The fact is we have some Expedia vouchers so we are using that opportunity to visit Paris. It’s time to raise the Oriflamme to the tourist sites, say bonjour and bienvenue to the city of lights and the city of romance and au revoir to French cliches of surly waiters, cheese eating surrender monkeys, a frenchman with a moustache, Breton stripe top with a baguette and string of onions around his neck riding a bicycle, an impossibly thin French woman in an artistic black and white french film smoking a cigarette and speaking very few words. We did not find any of those, we found the French lovely. What we did do, along with Google maps on the phone, was underestimate the size of Paris. 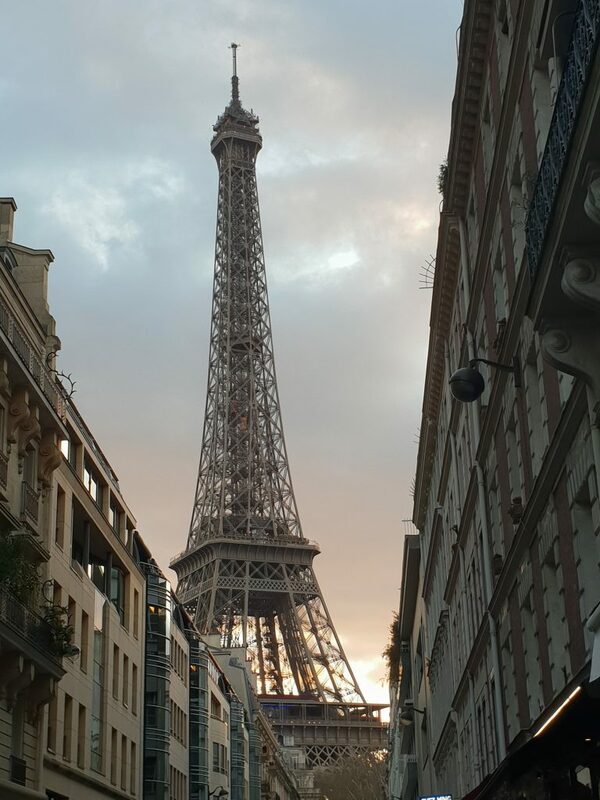 We thought we would be able to walk it all, but covering over 10 miles each day on foot is not a clever thing when there is a great metro system to get the best views in Paris. We also managed to make this amateur video! The Eiffel Tower is magnificent. It rises above the city and was our number one destination on the day we arrived. It didn’t look that far, but La Dame de Fer is deceptive at 324 metres tall. 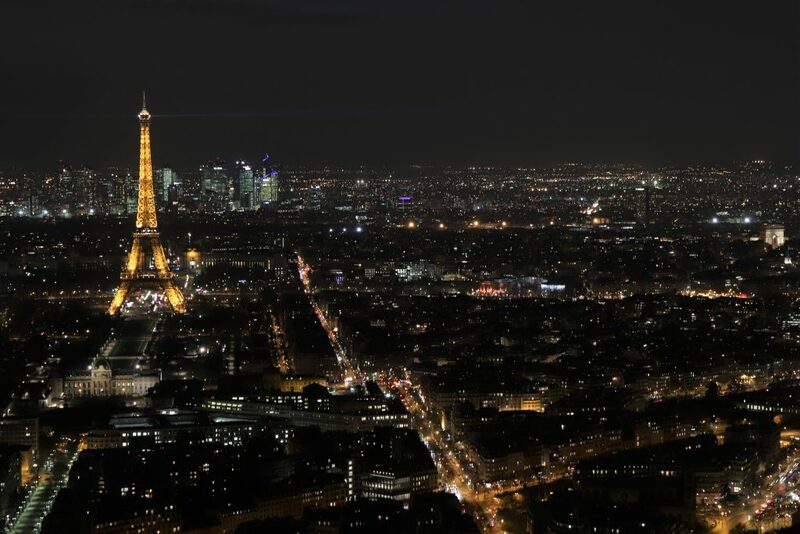 It’s much prettier than we originally thought and is rightfully the top sight to see in Paris, lit up and sparkling the first 10 minutes of every hour in the evening. 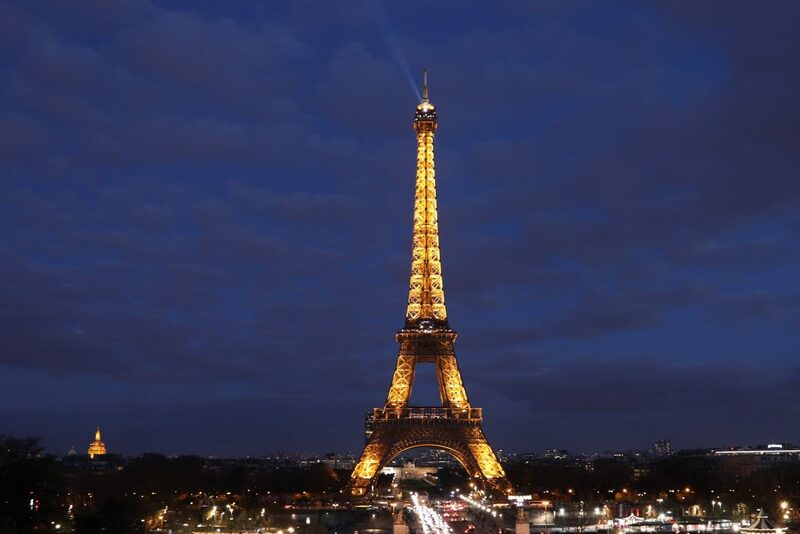 How to avoid the queues at the Eiffel Tower? Easy don’t join one. The Eiffel Tower gets an average of 25,000 people ascending the tower every day and by a massive coincidence, they will all seem to be there at the same time you are. You can’t get the best view if you are in the tower. We wanted to see her beauty and did so from the Trocadero. Unfortunately joined by 100s of others, but ignoring the view and instead trying to perfect the same perfect cliched Instagram shot, head tilted backwards, arched back, and one knee bent or travel blogger pose with arms out. The best view of Paris and the Eiffel Tower though is from the 360 degree observation deck on Montparnasse Tower. It’s also a lot less crowded. We went up in daylight and stayed for sunset for a truly fantastic view. The Louvre is the world’s largest art museum. This place is massive, just like the rest of Paris, we’ve underestimated the size. There are 38, 000 objects here. If I was to give each object 1 minute of attention, it would take nearly 4 weeks to view everything and that does not include a tea break either. The Louvre palace itself is a work of art, the glass pyramid was where we started with our pre-booked tickets. We’d heard about the queues, the waiting lines and times so we chose a Wednesday evening when the crowds would be less. Dare I say that with 38, 000 objectis to view, there are too many to appreciate. The map you get will not give an indication of how long it will take you to visit, you maybe better off selecting what you want to visit. We had our personal favourites so we headed for number one on our list to stand face to face with probably the most famous painting in the world. No, not The Fallen Madonna with Ze Big Boobies but La Gioconda, The Mona Lisa. And I don’t mean the former bar/eatery in Quarteira, Portugal. Sam finally has her hands on the Mona Lisa. We’ve seen other Leonard Da Vinci works at Nottingham Castle and Derby Museum but not to this magnitude of fame. For some, it will be the Venus de Milo, thousands of French paintings or one of the many ancient Egyptian artifacts. The Louvre expanded massively thanks to Napoleon, it’s a wonder there’s anything left in Egypt considering the amount of object here. Its good job Egypt has plenty otherwise our trip to Egypt would have been rather boring (it wasn’t, it was fab). The Arc de Triomphe stands masterfully at the western end of the Champs Elysees 50 metre high. Surrounded by the most crazy traffic and compulsory horn beeping. Notre-Dame de Paris to give it its full name. Standing for a selfie at the western from of Notre Dame, we review the picture and look like Quasimodo and Esmeralda. Or a modern day Shrek and Princess Fiona. C’est la vie. The nearest landmark point to our hotel just 10 minutes away. The Sacre Couer in Montmarte is the highest point in Paris. First thoughts, great view, looks like a giant Faberge egg and this palce looks familiar. The reason it looks familiar is from the films Ronin and Ameile and also because we have a picture here from Ikea on our bedroom wall of Montmarte stairs that we found by accident. An artsy area, many famous painters have lived here and today you’ll artists still painting and plying their trade for the tourists. So very jealous. All that history and art… I’d love to see it for myself. Looks like you had a great time. We’re lucky, just over an hour by plane for most Brits. We’d always put Paris off, but yes, loved it. Back home in Nottingham now and looking rather bland in comparison…..
That may be, but I’d love to visit there too. I love Paris. 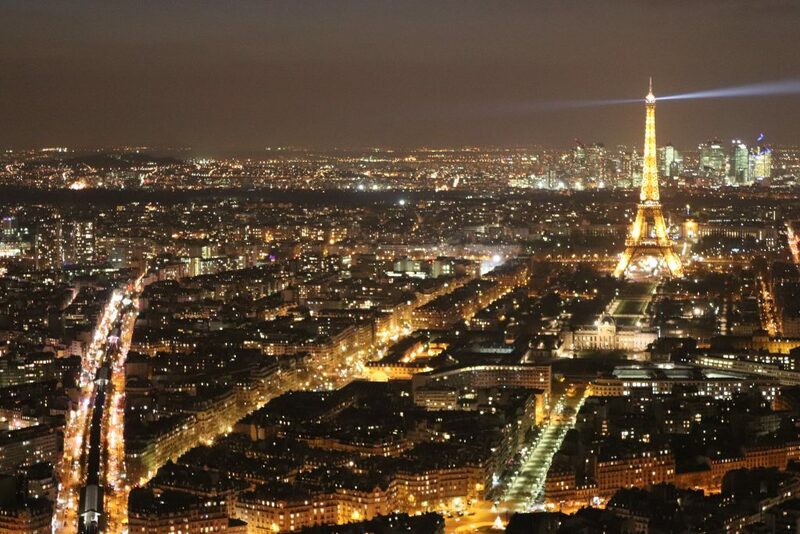 I was last there three or four years ago and on that occasion finally headed up the Eiffel Tower at night. It wasn’t quite as busy and offered a spectacular view of the city all lit up. My favourite view of Paris is from Sacre Couer. It’s a vast and sprawling city. Last time I was there I fulfilled an ambition to visit an absinthe bar and drink the ‘green fairy’ the traditional way with the contraption that drips water through a sugar cube. Well done on getting a decent photo of the Mona Lisa. I couldn’t get close enough for a clear shot. I was surprised at how small the painting was. We deliberately left the Louvre until the late opening on a Wednesday Evening as its open till 9:45 so hoped the crowds would be less. We’d seen videos of daytime crowds that were horrifying. There’s quite a bit of focus on that particular painting in the video as my Wife’s parents used to run a bar in Portugal called the Mona Lisa, they were filmed by the BBC when they purchased it and when they came back to the UK…. We loved the view from Sacre Couer, this was the nearest place to our hotel but couldn’t believe how busy it wa first thing in a morning!